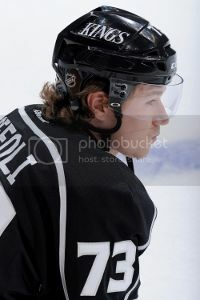 The good: Tyler Toffoli, the American Hockey League’s rookie of the year, was called up by the Kings on March 10 during a 17-games-in-30-days stretch. He made his debut on March 16, scored his first goal on March 18 to begin a five-points-in-five-games stretch, and was sent down to Manchester after appearing in one game in early April. The move was temporary, as Toffoli rejoined the team in Detroit following Dustin Brown’s two-game suspension and eventually posted six points (2-4=6) over 12 postseason games. I think he does the little things pretty well for a young guy. He’s not the biggest, most filled out guy. That will come with him. 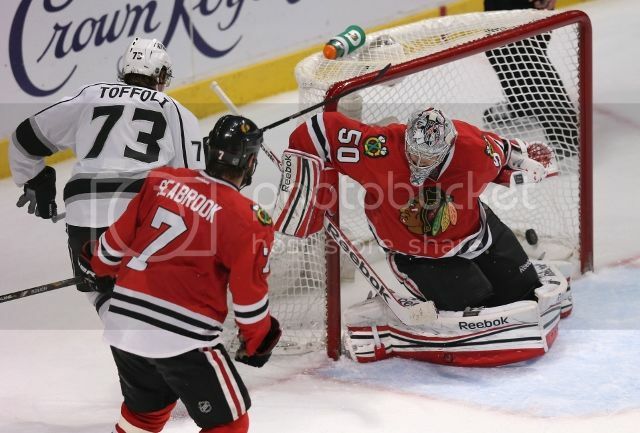 The one thing that stands out with Toffoli for me is his willingness to battle it out along the walls. Sometimes you don’t see it in a smaller, younger guys. He’s shown he’s willing to do that. That goes a long way in progressing as a professional. That’s probably the hardest part of the game. It’s the will on the wall. Toffoli’s boards work and ability to battle along the walls drew praise late in the season, while his net-driving and hustle play over the final 10 minutes of Game 2 of the San Jose series served as an encouraging glimpse of the full package the skilled forward has at his disposal. How about that dangle on Dave Bolland to bring the puck up the ice, by the way? The bad: Toffoli has never been known as the most gifted skater – though that’s not the sharpest concern when watching highlights of the speed and momentum he generated in setting up Trevor Lewis’ game winner against San Jose. He’s still a developing player in his own zone, and for him to earn a spot on one of Los Angeles’ top two lines, he’ll need to continue to fill out and make improvements in his own end. He also has only 10 regular season games of NHL experience (and 12 playoff games). Not to elevate his limited NHL experience too greatly, but is it even possible for someone eligible for the Calder Trophy to experience a sophomore slump? 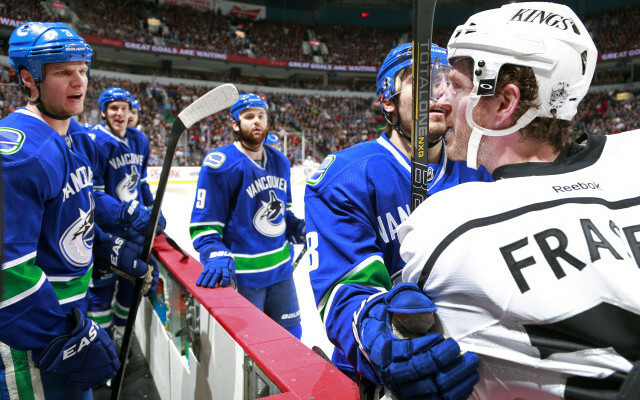 Going forward: So, can Toffoli play on the left side? A center when he was younger, he emerged as a top-flight right wing prospect by scoring 163 goals over 252 Ontario Hockey League games – and then an additional 29 AHL goals – before confirming that the optimism surrounding his NHL ascent was justified. But the Kings have Justin Williams and Jeff Carter serving as their top two right wings, and Trevor Lewis has been effective serving to the right of Jarret Stoll. Adjustments are possible – Carter and Lewis could also play center – though it appears that for Toffoli to play alongside players who best extract his strengths, he may have to make a switch to left wing, where there is a vacancy on the Richards-Carter line caused by Dustin Penner’s departure. Darryl Sutter has hinted at a potential shift in the past, and where Toffoli slots in will be one of the intriguing questions entering training camp this year. Matt Frattin also appears to be in a similar situation, though the ex-Leaf gained experience on the left side last season. Perhaps the primary question is whether Toffoli can first play at the required level for the full 82-games. Some might scoff at any hint of doubt; some also would have laughed at such questions asked of top Rangers prospect Chris Kreider an offseason ago, and he spent the majority of the season in the AHL. Toffoli still wears number 73. Plan is to get him stronger first. Then see if he’s a good winger in the American Hockey League or a winger in the National Hockey League. That will be the first step. Put your money on “a winger in the National Hockey League”. Toffoli showed as much intangibly – his maturity, his willingness to battle, his natural hockey sense – as the statistics provided when he was inserted into the lineup in the playoffs. Considering his scoring background and the improvements he made away from the puck, he’s certainly capable of a breakthrough season and should be considered a legitimate Calder Trophy candidate – though he’s likely to experience the usual highs and lows associated with young players.